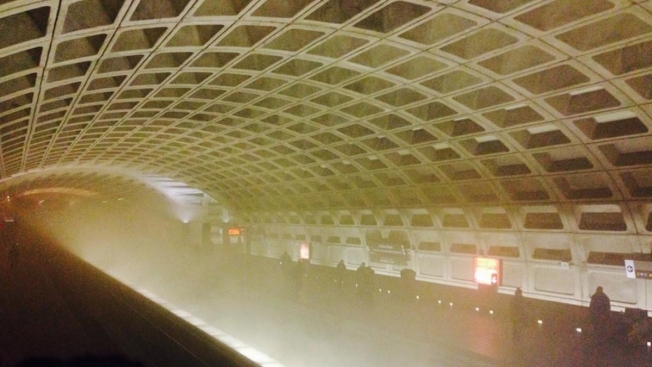 A viewer sent in this photo of smoke in the tunnel at L'Enfant Plaza. Bledsoe, a resident of Virginia, is now suing Metro for $5 million, claiming she suffers from emotional distress since the incident. Bledsoe was one of the passengers on the train when it stopped just past the L’Enfant Plaza Metro Station on Jan. 12, 2015 and filled with smoke. One person died and more than 80 people were hospitalized. According to the lawsuit, passengers were frantic and started to cough once the smoke came in the train. One person near Bledsoe vomited, the suit says. To avoid inhaling too many fumes, Bledsoe lay on the ground. She was there for 40 minutes. That’s when she texted her fiancé. Still, Bledsoe “suffered smoke inhalation,” the lawsuit says. Bledsoe was nursing, and she worried what the smoke would do to her baby. Sherry Ly, Metro Spokesperson, said Metro cannot comment on the current lawsuit. When passengers were finally able to leave the train, they walked down the tracks. Bledsoe saw people receiving medical attention, including the person who died. The lawsuit says she’s never been the same. “Bledsoe is frightened to take the Metro for any purpose and experiences severe anxiety at the notion of taking a Metro train,” it reads. Before the incident, Bledsoe regularly rode the train to work. Now, she pays for parking. The lawsuit claims Metro did not provide correct training for employees to know how to use the ventilation system during a fire emergency. It also says that Metro did not conduct proper upkeep of the ventilation system, nor did it run a thorough examination of the rail the train occupied. Metro “was otherwise negligent, careless, or wrongful in its failure to take reasonable precautions to protect Plaintiff Megan Bledsoe and its other passengers from injury,” the lawsuit says.